Physicists exchanged cognac in Copenhagen at the conclusion of a bet about supersymmetry and the LHC. 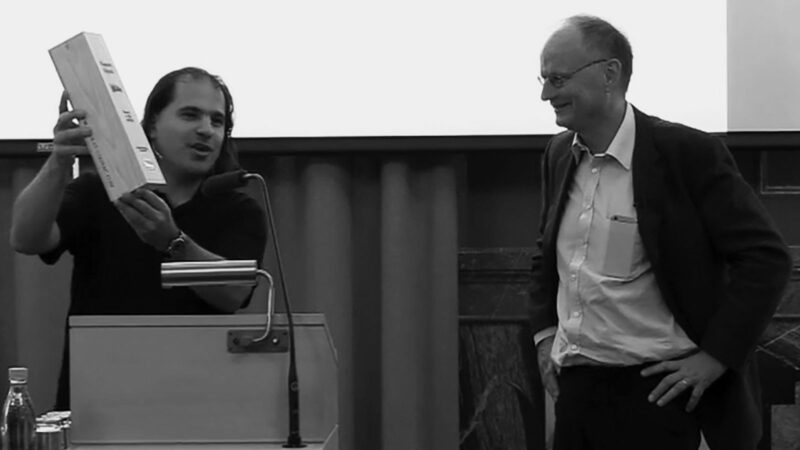 As a general rule, theorist Nima Arkani-Hamed does not get involved in physics bets. That’s how Arkani-Hamed found himself back in Copenhagen this week, passing a 1000-Krone bottle of cognac to one of the winners of the bet, Director of the Niels Bohr International Academy Poul Damgaard. Arkani-Hamed had wagered that experiments at the LHC would find evidence of supersymmetry by the arbitrary date of June 16, 2016. Supersymmetry, SUSY for short, is a theory that predicts the existence of partner particles for the members of the Standard Model of particle physics. The deadline was not met. But in a talk at the Niels Bohr Institute, Arkani-Hamed pointed out that the end of the gamble does not equal the end of the theory. He pointed out that so far the LHC has gathered just 1 percent of the total amount of data it aims to collect. With that data, scientists can indeed rule out the most vanilla form of supersymmetry. But that’s not the version of supersymmetry Arkani-Hamed would expect the LHC to find anyway, he said. It is still possible LHC experiments will find evidence of other SUSY models—including the one Arkani-Hamed prefers, called split SUSY, which adds superpartners to just half of the Standard Model’s particles. And if LHC scientists don’t find evidence of SUSY, Arkani-Hamed pointed out, the theoretical problems it aimed to solve will remain an exciting challenge for the next generation of theorists to figure out. Arkani-Hamed shrugged. But it turned out he was not the only optimist in the room. Panelist Yonit Hochberg of the University of California, Berkeley conducted an informal poll of attendees. She found that the majority still think that in the next 20 years, as data continues to accumulate, experiments at the LHC will discover something new.